Gold and silver futures fell on Friday, adding to what would have already been sharp weekly losses. Silver led declines among precious metals, and closed at its weakest level in 15 months. Gold ended near a 4-month low. Gold for August delivery shed $13.60, or 1.1%, to finish at $1,209.70 an ounce on the Comex division of the New York Mercantile Exchange. The settlement is the lowest since March 15 when prices closed at $1,200.70 an ounce. 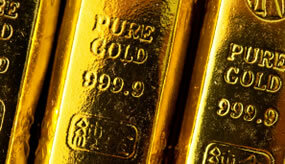 Gold saw pressure, according to analysts, on a better-than-expected U.S. jobs report. "Overall, gold is trading on the beat of the non-farm number and it’s just making people think that the Fed will continue to be hawkish," Bloomberg News quoted Ryan McKay, a commodity strategist at TD Securities in Toronto. Friday’s employment report from the U.S. Labor Department said employers created 220,000 new jobs in June, the largest in four months and second biggest increase of the year. Expectations for July had been around the 175,000 level. In addition, upward revisions added 47,000 more jobs to April and May than previously reported. "Nineteen traders and analysts took part in a Kitco News Wall Street survey. Thirteen voters, or 68%, see gold prices falling by the end of next week. Four voters, or 21%, were bullish, while the remaining two voters, or 11%, looked for prices to be sideways. Meanwhile, 814 votes were cast in an online Main Street poll. A total of 386 voters, or 47%, called for gold to bounce over the next week. Another 324 online voters, or 40%, said that gold will fall, while 104, or 13%, were neutral." Elsewhere, silver for September delivery plunged 55.8 cents, or 3.5%, to close at $15.425 an ounce. It reached as low as $14.34 an ounce. Still, the day’s settlement is the weakest since April 8, 2016 when the precious metal ended at $15.384 an ounce. Silver futures sank 7.2% this week, also for their fifth weekly decline in a row. They are now 3.5% lower for the year so far. October platinum lost $6.20, or 0.7%, to $904.10 an ounce, for a 2.4% weekly drop. Palladium for September shed 95 cents, or 0.1%, to $831.25 an ounce, registering a loss this week of 0.7%. Platinum’s decline pulled is price into the red for the year to date — off 0.2%. Meanwhile, palladium continues to enjoy exceptional gains overall. The metal is 21.7% higher since ending last year at $683.25 an ounce. Gold fell $9.25, or 0.8%, to $1,215.65 an ounce. Silver declined 17 cents, or 1.1%, to $15.84 an ounce. Platinum added $6, or 0.7%, to $911 an ounce. Palladium shed $1, or 0.1%, to $834 an ounce. For the week, losses totaled 2.1% for gold, 3.8% for silver, 1.2% for platinum and 0.8% for palladium. Gold coins advanced by 5,000 ounces after rising by 3,000 ounces previously. Splits include 4,000 ounces in American Gold Eagles compared to 2,000 ounces previously and 1,000 ounces in American Gold Buffalos to match last week. Silver coins moved up by 320,000 ounces compared to 280,000 ounces previously. American Silver Eagles accounted for all silver sales for a second week in a row.